Drawing I like to do life drawing. I think I've been kind of heavy over the years on figures. 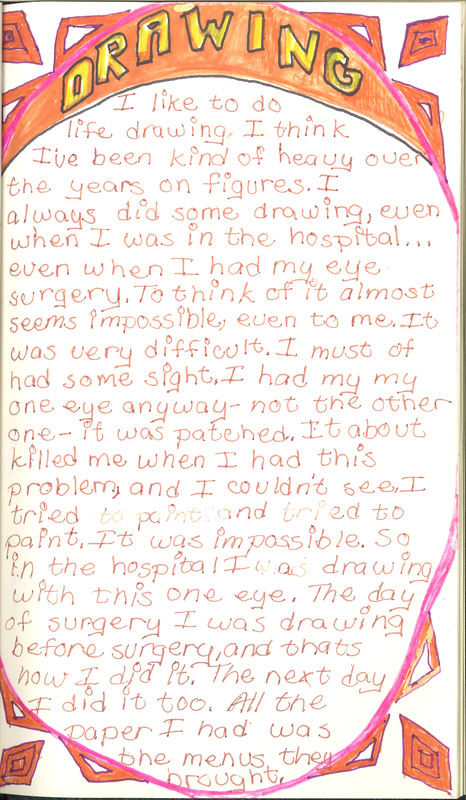 I always did some drawing, even when I was in the hospital...even when I had my eye surgery. To think of it almost seems impossible, even to me. It was very difficult. I must of had some sight. I had my my one eye anyway - not the other one - it was patched. It about killed me when I had this problem, and I couldn't see, I tried to paint and tried to paint. It was impossible. So in the hospital I was drawing before surgery, and thats how I did it. The next day I did it too. All the paper I had was the menus they brought.